Charlestown, Nevis (April 27, 2011) — The Nevis Island Assembly has approved a Resolution guaranteeing a US$57 million loan that is being sought by West Indies Power (Nevis) from the United States Government’s Export Import (Ex-Im) Bank for the construction of an 8.5 megawatt (MW) power plant in Spring Hill, Nevis. The passage of the Resolution follows a recent high-level visit of officials from Ex-Im Bank (including its vice president John Schuster, senior loan officer Uduak Essien, attorney Michaela Ricchiute, and Financial Advisor Chris Dymond) to complete Ex-Im’s evaluation of the Nevis Geothermal Project. Finance Minister and Premier, the Hon. Joseph W. Parry, mover of the Resolution, reflected that since the turn of the century, fluctuating oil prices on the world market have created greater interest in alternative and renewable sources of energy that were less dependent and independent of fossil (oil) fuel. “This geothermal project is unprecedented in the eyes of the people of this part of the hemisphere, in the eyes of the people of CARICOM and the OECS and specifically for the people of St. Kitts and Nevis. 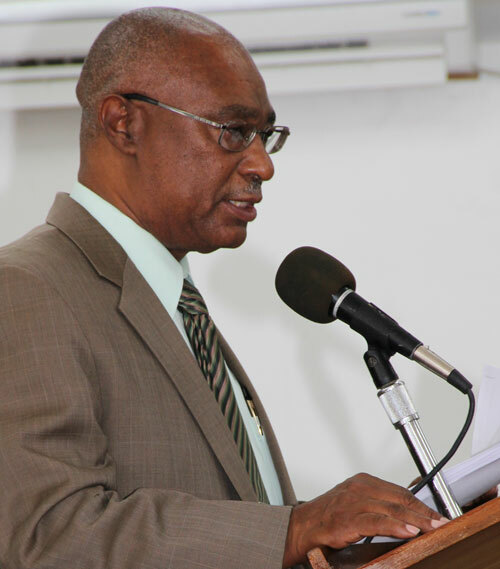 It will not only impact on government’s revenues, but it will bring down the cost of energy on the island, it should impact on prices in the business sector, and it should serve as an attraction to businesses and certainly in terms of green energy and a green country, it will make Nevis an exceptional place in the world,” stated the Honorable Premier. The Resolution received four hours of commendations from all members of the Government benches including Deputy Premier, Minister of Social Transformation, Health, Trade and Industry and St. John’s MP, the Hon. Hensley Daniel; Minister of Agriculture, Lands, Housing, Cooperatives and Fisheries, Physical Planning, Communications, Works, Public Utilities, Post, Natural Resources and Environment, St. Paul’s MP, the Hon. Robelto Hector, and Junior Ministers Dwight Cozier and Carlisle Powell. Premier Parry was invited and will meet with Puerto Rico Energy officials to continue ongoing discussions of the export of electricity to Puerto Rico in early May.